Sebastian Conceicao, 53, of Dorset Street, London, was fined £184 and must pay £30.03 victim surcharge, £300 costs, after admitting causing unnecessary suffering to a goose, a protected animal, by leaving it tethered by twine, which caused an injury to the animal’s leg in Worthing between July 21, 2018, and August 6, 2018. He was disqualified from keeping any animal for 12 months. Carlo Napolitano, 31, of Watling Court, Butts Road, Southwick, was given a community order with Rehabilitation Activity Requirement and mut carry out 100 hours’ unpaid work after admitting failing to provide a specimen of blood for analysis when required at Saltings Roundabout, Lancing, on October 25, 2018. He must pay £85 victim surcharge, £85 costs, and was disqualified from driving for 40 months. He also admitted driving without the correct licence, no separate penalty. Daniel Foster, 28, of Rowlands Road, Worthing, was fined £120 and disqualified from driving for 36 months after admitting drug-driving (106ug/l cocaine) in Lyminster Road, Lyminster, on April 19, 2018. He must pay £30 victim surcharge, £85 costs, after admitting drug-driving (in excess of 800 benzoylecgonine) in Lyminster Road, Lyminster, on April 19, 2018. He also admitted driving without insurance, no separate penalty. Justin Manning, 31, c/o The Lawns, Sompting, was given a community order with Rehabilitation Activity Requirement and must pay £85 victim surcharge, £85 costs, after admitting sending an electronic message that was grossly offensive or of an indecent, obscene or menacing character in Worthing on September 30, 2018. Peter Murray, 45, of The Wardley Hotel, Somerhill Avenue, Hove, was given a community order with Building Better Relationships Programme Requirement and Rehabilitation Activity Requirement and fined £30 after admitting assault by beating in Broadwater on September 17, 2018. He must pay £85 victim surcharge, £85 costs. Karl Daly, 29, of The Strand, Goring, was fined £50 after admitting breaching a community order by failing to report for unpaid work on September 29, 2018, and October 20, 2018. 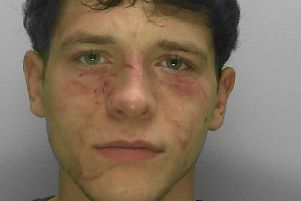 Fardin Farji, 25, of Buckingham Road, Shoreham, was given a community order with Drug Rehabilitation Requirement and must pay £116 compensation after admitting stealing two Gucci gift sets worth £116 from Beales, Worthing, on October 21, 2018; and stealing Gucci and Hugo Boss gift sets worth £107 from Beales, Worthing, on October 23, 2018. Annie Hutchings, 26, of Pavilion Parade, Brighton, was given a community order with Rehabilitation Activity Requirement and must carry out 120 hours’ unpaid work after admitting failing to provide a specimen of breath for analysis in Worthing on October 27, 2018. She must pay £85 victim surcharge, £85 costs, and was disqualified from driving for 20 months. Dorota Lawrie, 44, of West Way, Wick, was given a community order with Rehabilitation Activity Requirement and fined £50 after admitting failing to provide a specimen of breath for analysis in West Way, Wick, on October 27, 2018. She must pay £85 victim surcharge, £40 costs, and was disqualified from driving for 45 months. Juan Cruz, 32, of Mendip Road, Worthing, was given a community order and must carry out 180 hours’ unpaid work after admitting using or threatening unlawful violence, causing fear for personal safety, in Worthing on March 21, 2018. He must pay £85 victim surcharge, £620 costs, and was also given a restraining order.